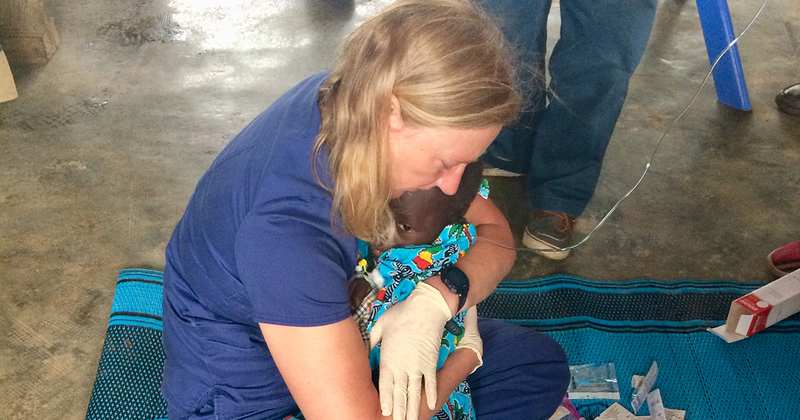 It was early in the morning on Sept. 14, the final day of the Togo Mercy Medical Team clinic. Dark, ominous rain clouds hovered overhead. Nurse Melanie Algrim was the first to notice 5-year-old Yendutien lying unresponsive in a corner of the small classroom that served as the vitals/intake ward. 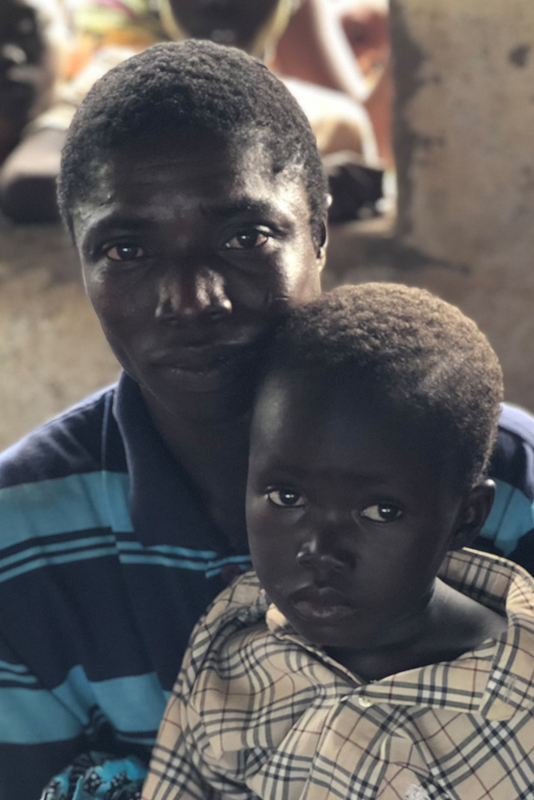 Seated next to him was his very nervous father, who had traveled from more than 20 miles away — near the Ghana border — to come to the clinic. Algrim, a retired 20-year veteran of the Air Force, quickly picked up Yendutien’s limp, little body. Followed by a train of medical professionals, she rushed him to the pharmacy room at the other end of the building. The team wasted no time. Yendutien’s temperature was 107.6 degrees. It took several tries to start an IV of glucose and Tylenol. Next, artemether, a powerful anti-malarial, was administered via injection. Just as the team began its intervention, a powerful deluge began outside, and many in the crowd flooded into the pharmacy room to escape the downpour. They all got a front row seat to what happened next. After the meds were administered, MMT chaplain Rev. 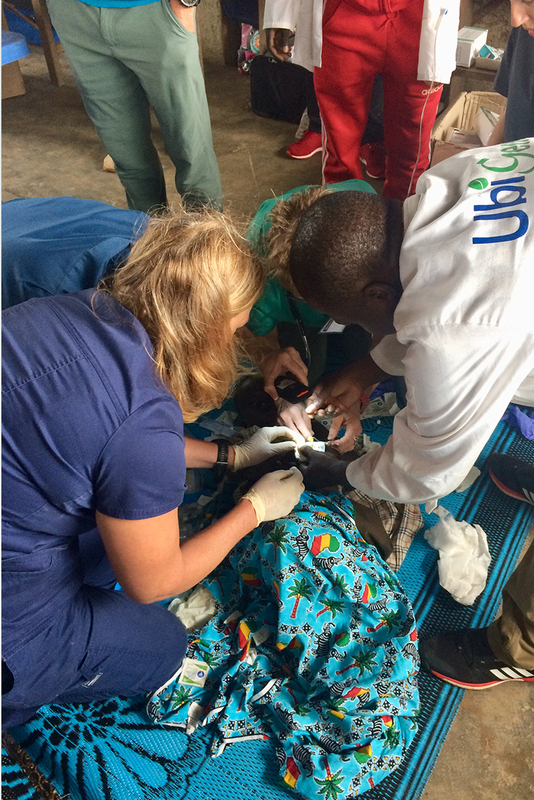 Dr. David Elseroad and some of the Togolese pastors laid hands on Yendutien, whose body was being convulsed by chills, and prayed over him. Then Steph, my wife, wrapped Yendutien in her arms and held him tightly for nearly an hour. Meanwhile, our daughter, Ariana, had noticed the agitated state of Yendutien’s father. I asked Rev. Lambon, the president of the Lutheran Church of Togo, to pray with him because my Moba [language] is no longer good enough to do so. Yendutien’s father broke down and sobbed. Steph reluctantly released her grip on Yendutien, and the medical staff took him to a more private treatment room. There he spent the next six hours hovering between life and death while his father held him. Yendutien, whose name means “God gives,” survived. His name could not be more appropriate. May God be praised for the life He has given to this beautiful little boy! The Rev. Gary Schulte is area director for LCMS West Africa.